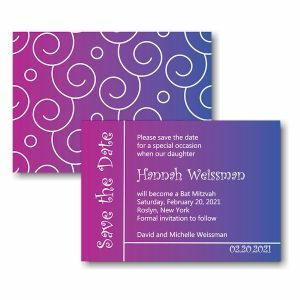 Your guests will be excited to receive this trendy save the date card for your daughter’s Bat Mitzvah! 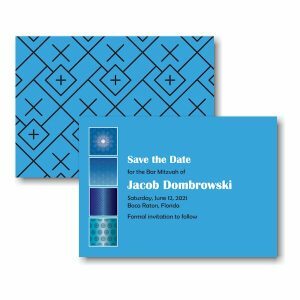 Digitally printed on both sides of 120# white matte card stock, this save the date features your wording details in white against a gradient background of fuchsia-to-purple-to-deep blue on the right. “Save the Date” will print vertically along the left, and your wording will be displayed as shown. The backside displays a a fun swirled pattern. 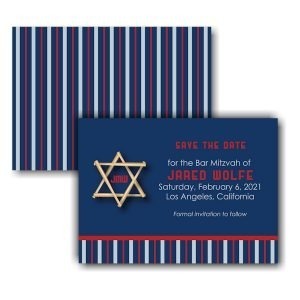 Your guests will be excited to receive this trendy save the date card for your daughter’s Bat Mitzvah! Digitally printed on both sides of 120# white matte card stock, this save the date features your wording details in white against a gradient background of fuchsia-to-purple-to-deep blue on the right. “Save the Date” will print vertically along the left, and your wording will be displayed as shown. The backside displays a a fun swirled pattern. Measures 5″ wide by 3-1/2″ high. Shown with white ink and combination lettering styles Myanmar Text and Curlz MT. Single white envelopes accompany this card.